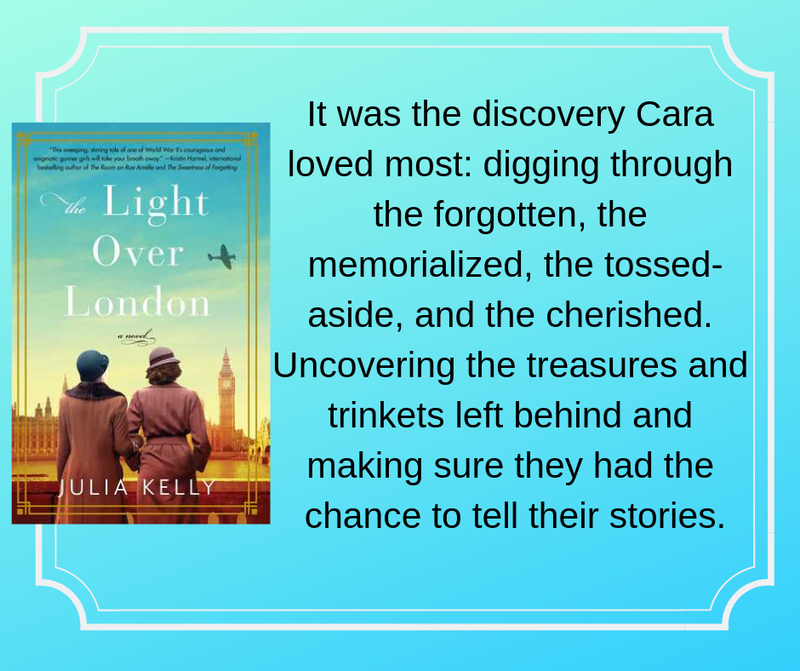 Cara is working with an antiques dealer outside of London, and while inventorying the home of the late Lenora Robinson, she comes upon a diary from WWII. The diary does not belong to Lenora and Cara is determined to discover the identity of the writer so she can return it. Part of her curiosity lies in the mystery surrounding her own grandmother's WWII service. So one timeline is present-day with Cara. As she reads the diary entries or discusses them with her neighbor Liam, who is also a history professor, the reader is transported to 1940s England and gets more information about Louise (the owner of the diary). I was much more invested in the story of Louise, and I feel that storyline was a much larger portion of the book. I enjoyed Cara's storyline but it felt like a secondary plot. It would be fun to be in Cara's position of discovering the diary and researching the person. Though, I think Liam did most of the work on tracking down who Louisa was. I enjoyed learning about the "Gunner Girls" as the females in the anti-aircraft artillery battalion were called. I hadn't read a story that featured them before so it was fun getting a glimpse of how females were employed by the Royal Army. Louise and Cara were instantly likable characters and Kelly's a wonderful storyteller. The writing is compelling and I totally regretted that I didn't pick up the book sooner. I needed a bit of a reading break after finishing The Island of Always and I had a busy weekend so I didn't pick up The Light Over London until Sunday night. Immediately I wished I had started it earlier in the day as I wanted nothing more than to keep reading straight through. I hated that I had to wait until each evening to get back to the book. So I highly recommend you set aside a day and settle in with tea, cookies, and this book. 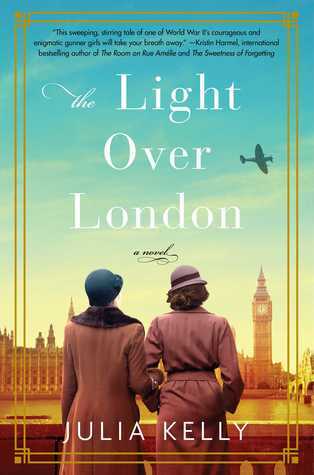 Susan also reviewed The Light Over London along with 4 other WWII novels coming out this month. The theme of WWII events, diaries, and dual timelines is very popular these days. I've liked most of those type books I've read, so I'll keep this one in mind. I love those opening lines, and they remind me of one of my favorite habits: browsing through antique stores. Enjoy, and thanks for visiting my blog. Seems WWII is a theme this week. Thanks for sharing. Sounds like a good book, and the discovery of a WW11 diary at the beginning is intriguing! Here is my Tuesday post! It has been awhile since I've read a book set in WWII. Like the sound of this one. This does sound good and I do like dual timelines although inevitably the one set in the past ends up being far more satisfying than the one in the present. I have a hard time with WWII stories but this one seems good. The first paragraph is a nice lead-in for the story. Would doesn't love those kinds of discoveries. I've been interested in fiction set around WWII. This sounds like a good one. I'm not a fan of stories centered around WWII but I hope you enjoy it!